In every house, there are windows for you to let the natural light in but sometimes, you like a little privacy or maybe you don’t want the house to be too bright. This is where window treatments come in and although there are so many different types out there, shutters can be a great option because they are functional but beautiful as well. Although this may be a rather old-fashioned option, it really looks rather timeless and is great if you are looking for a more traditional aesthetic. That’s not all, they make the home look warmer and more welcoming as well. 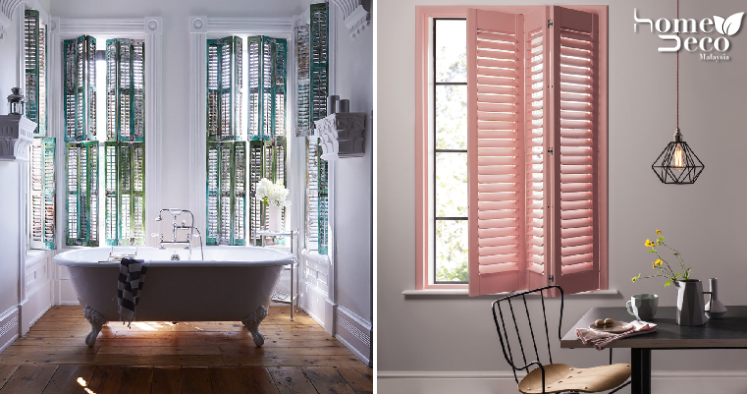 Inject a little charm into your home with these pretty pink shutters that go really well with some neutral colours like grey. It will liven up your home and make it look more fun while letting you have privacy inside. Go for a rustic and shabby chic look with this charming shutters in stylish emerald and green colours. Paired with some modern looking accessories, the shutters look awesome and create a very stylish look. There are many different kinds of shutters that can be used for your home and folding shutters are one of them. They make a great privacy barrier because once you close them they act very much like doors and sometimes, you can even use them instead of actual doors. Shutters can be used for almost any kind of windows you have at home, even for the bedroom. These big bay windows in the bedroom have some chic blue shutter to shut out the outside light and noise from filtering in and goes perfectly well with the rest of the decor. The white frame around its edges make the shutters look more outstanding and the shade of blue complements the quirky wallpaper.